Whenever I get e-mails or mailers for these bonus offers, I always weigh the benefits with the effort. Not all bonus offers are worth pursuing. I’ve noticed that the Barclay Aviator card tends to have the best offers on a consistent basis. The best type is their 3×500/10k, 3×750/15k, and 3×500/15k bonuses. These are all variations of the same offer, whereby you spend at least $500 or $750 in three specific consecutive months and get either 10k or 15k American Airlines miles as the bonus. 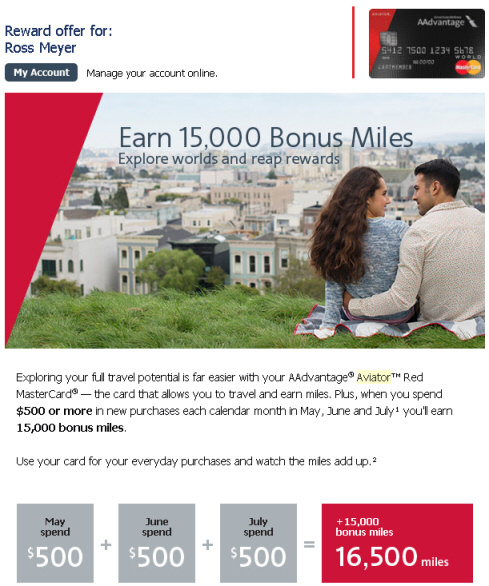 The best is obviously the 3×500/15k bonus because for $1500 in spending you end up with 16,500 miles. That’s close to the return you get on some sign-up bonuses! Despite needing to spend $8,500 to meet the minimum spends on my current card sign-up bonuses, I’ve decided to fit this bonus offer in. It’s that lucrative. The second Aviator deal I got a mailer for was a category bonus. After activating the promotion, I will earn 3x miles on gas, restaurant, and home improvement store purchases. This is pretty good, as far as category bonuses go; gas and restaurants are very common purchases. Nicoleen got the same offer for her Aviator card. And the best part is that purchases in these bonus categories also count toward the 3×500/15k offer I just mentioned. In late May, in the middle of my 3×500/15k spending, I realized it was time to either cancel my card or have the annual fee waived/reimbursed. When I called Barclay to try for a retention offer I was pleasantly surprised to be offered not only an annual fee waiver, but also an additional miles bonus offer! The rep said if I spend $1k in the next 90 days I will get an additional 5,000 miles. This will be easy since I’ll be automatically meeting that spend by taking advantage of the other offer. That makes 21.5k miles for $1500 in spending (PLUS whatever extra I get from the 3x categories)! 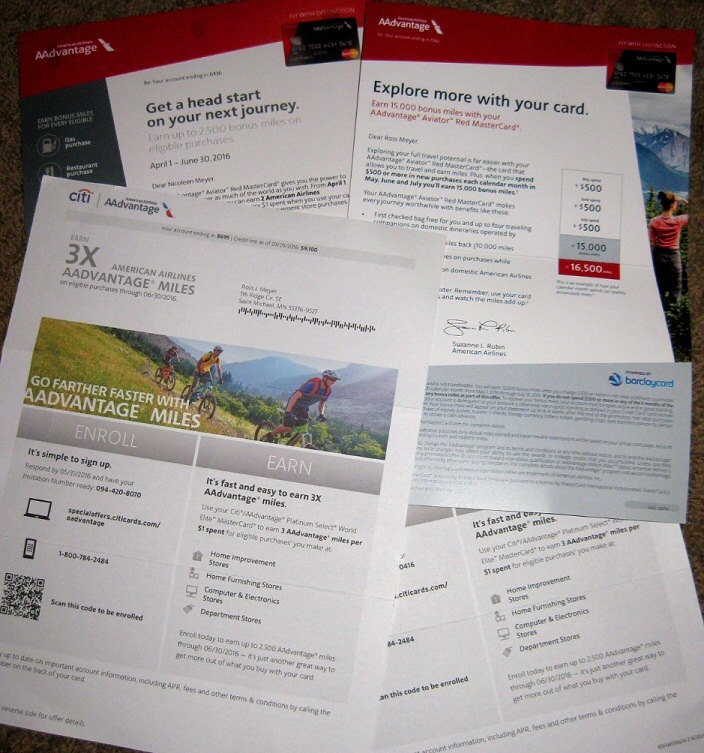 Nicoleen and I both have the Citi AAdvantage Platinum card, our other American Airlines miles earning cards. We both got a mailer with a category bonus through June. Any spending at home improvement stores, home furnishing stores, computer & electronics stores, and department stores, will earn us 3 miles per dollar spent. With the spending requirement on the aforementioned Barclay offers, plus all the spending we have to do for my last round of card apps’ bonuses, we probably won’t be taking aadvantage of this offer. It’s inconvenient to get bonus offers when you’re in the middle of making some sign-up bonus spending requirements. But if the offer is good enough (the Barclay 3×500/15k deal) it might be worth the hassle to work it in to your strategy. One thing’s for sure: I’ll be looking for ways in the near future to start burning my wellspring of American Airlines miles. 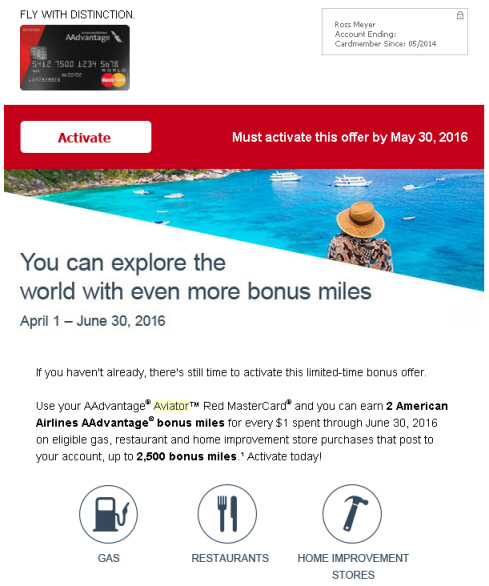 This entry was posted in American Airlines, Barclaycard, Citi, Credit Cards on June 17, 2016 by Gomanson. Beach with kids! Beach with kids!